A new addition to our family arrived yesterday. 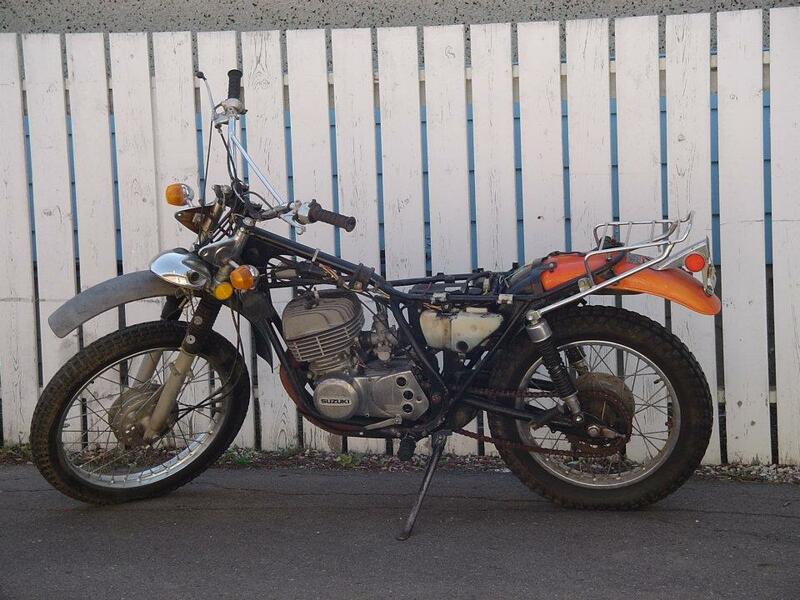 A 1976 Suzuki TS400. She is in need of a lot of TLC but hopefully we can provide her with that over the winter. I say hopefully because I know nothing abo ut motorcycle maintenance. Which is l the reason for our new acquisition. I hope to learn as I get her back on the road with a lot of help from a Clymers manual and the very helpful folks a advrider.com. Last night I pulled the carb off and removed all of the gummed up crap that 3 years of sitting had developed. I checked to compression and there is over 100lbs, so it looks like I don’t need to redo the topend. I also changed one of the sparkplugs. Wait! Isn’t it a single cylinder bike? Well yes it is, and I don’t totally know why it has 2 sparkplugs. Perhaps in case one gets fouled, or perhaps for different driving conditions? I’m open to hearing from anyone out there who know. Tonight I will get to work on the gas tank and oil injection system. There is some rust in the tank, but it’s not too bad. And the oil….? My best guess is that it will be the consistency of tar, but who knows I may be pleasantly surprised.